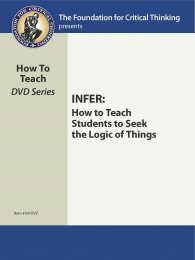 301DVD How to Teach Students To Seek The Logic of Things (Infer DVD) $14.95	 Qty. We can understand something only by assuming that it has a logic, some order or coherence, reason or method, structure or pattern that makes sense, and so can be translated by a reasoning mind into ideas effectively grounded in reasoned judgment and expressed in an ordered, rational way. In this, the opening tape in the “How to Teach” series, Richard Paul sets out the foundations of a critical approach to teaching and learning. He elucidates how this approach fosters the ability of students to seek and grasp the logic of what they are studying by giving it a logic in their minds.